Cinnabon – As a supporter of the DAISY Foundation and nurses, they offer a choice for a FREE Cinnabon® Classic Cinnamon Roll, MiniBon®, or a four-count of the newest treat, BonBites™, to nurses presenting their medical ID badge. Yum! Einstein Bagels – on May 11, you can get an FREE Espresso Buzz bagel with schmear. The Nerdy Nurse has all the details here on the offer and a contest they are running this week. Exceptional Nurse – they are giving away a free copy of their book “The Exceptional Nurse: Tales from the trenches of truly resilient nurses working with disabilities” on May 9-10. 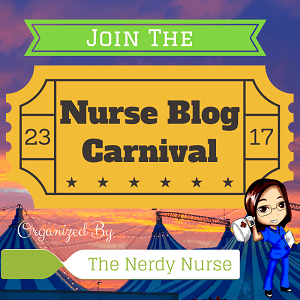 The Nerdy Nurse – she has a huge giveaway going on right now- new cool stethoscope, clogs, books, just to name a few! Just need to sign up on her site here. Bayada – they are giving away 5 gift cards of $500 each in celebration of Nurses Week! I know every nurse could use that! Enter here. Medical Solutions – they are throwing a party of you nurses are having a HUGE giveaway to celebrate! They even made their own website called We Love Our Nurses…. aww, we love you too! Go check out the fun here. And….they also are giving away three $2000 scholarships for my money strapped nursing students. You have to write a small essay, but you’re in school, so that’s a breeze! Go enter here. Allnurse.com – is doing 7 days of giveaways contest. There are multiple contests such as meme contests and best quotes. Over $1700 in prizes will be given away. Check out the contests here. Fresh RN – our friend, Kati, wanted to share some Nurses Week love by showering you with some cool gifts (include her awesome Becoming Nursey). All you need to do is enter here. Uniform Advantage – check them out on Facebook & Instagram – they are giving away 2 pairs of scrubs on each platform. The Wellness Chicks – not only do they want to teach you how to be healthier, but this duo wants to give you some Scrubs Snacks and scrubs to put them in! Check out the details for the May 10th event here. Adar Medical Uniforms – they want to know who your nursing hero is and wants you to share it with the world! Take an awesome picture in your scrubs. Post the photo to Facebook, Twitter, or Instagram and in the text area, name your nursing hero or inspiration with quick line or two explaining why. Mention @adarmeduniforms and/or use the hashtag #AdarLovesNurses. At the end of the week TEN winners will be chosen for a bunch of cool gifts – including scrubs for the year. Go learn more about it on their website here. Cirrus Medical Staffing – they are running a few fun contests with some great prizes. You can see the rules to enter here. Show Me Your Stethoscope – the awesome group that was started by nurses just like you on Facebook is doing amazing things – you need to check them out. But they are also giving away TWO $50 Amazon gift cards. You can enter here. Scrubs Mag – they have a ton of contests going on giving away scrubs, stethoscopes and cool nursing swag. You can enter here. The Nurses – if you want a great read about the true life & struggles of nurses, then this is your book! You can read my gushing review here! But if you want to read the book yourself, the author and publisher has offered it on Amazon for FREE on Kindle, but just about $6 for a hardcover. Go get it here! Starbucks – not officially for Nurses’ Week, but from May 5-14 you can get a half off Frappuccino, so they might as well say its for Nurses’ Week! Well, that’s the round up… there were a few restaurants who got a head start last Saturday, May 6, like Chik-fil-A – hope you caught it. And Chipolte said they aren’t officially doing anything this year, but some local restaurants are offering BOGO for nurses and teachers – so, I would just ask. If I missed any good deals or giveaways, leave the link in the comments & I will get them added! I hope one of you has some luck and wins big – let me know if you do so I can give you a Yahoo!! Although we go unappreciated most of the year, soak up the joy of Nurses Week, because I know we want so much more for nurses week – you can read my viral post and thoughts here! Fun Stuff, Nurses Unite, Student Nurses giveaway, Nurses, Nurses Week, Nursing, nursing school, Nursing students, student nurse. permalink. Awesome roundup! We are also doing a prize giveaway at http://weloveournurses.com/ Happy Nurses Week to all! Thanks for the kudos and kind words! And super thanks for sending your link – have added it to the list & ready to party!! What a great list! I wish I had found your blog sooner, I’ll definitely save this post for next year.